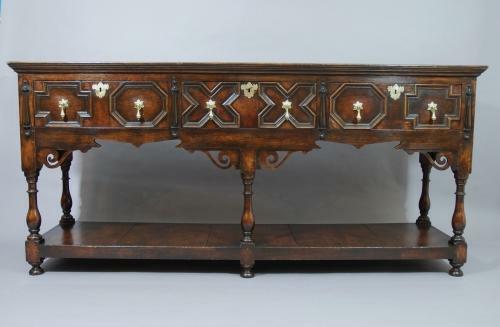 This is a mid 20thc reproduction oak & walnut three drawer moulded front dresser base in the style of around 1670. The drawer fronts have various moulded panels surrounded by walnut & oak. The handles are brass drop handles, the escutcheons are of high quality brass with engraved designs. The central drawer has a working lock from the 18thc, the other two drawers cannot be locked. There are four applied turnings on the front of the dresser which are in ebony. The shaped bottom rail is supported by pierced oak brackets. The piece stands on five turned legs which stand on turned feet. The pot board at the bottom consists of five oak boards & can be used to display 'pots' or other items. The sides have recessed panels & there is an oak, shaped bracket on the back edge of the back legs, which allows the piece to fit closely to a wall.